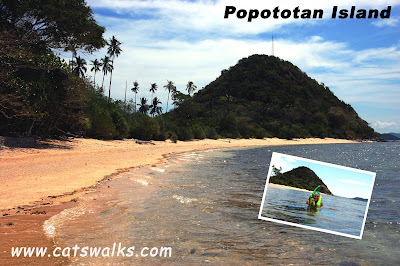 After a 2-hour scenic boat ride from Coron Town, we finally reached our first destination--Popototan Island. There are 2 resorts on this island, Coral Bay and Evergreen Diving Resort. Evergreen is owned and operated by a German named Arno who used to build airports before deciding to settle in Popototan. I booked Evergreen because I read on the internet that their housereef is spectacular. I already knew that the beach itself would be mediocre (the sand was not fine) so as soon as we arrived I was itching to go snorkelling to see what I came for--the colorful corals! Included in the price (per person 30 euro/day) was full board and lodging, so before plunging into the water we had a nice meal of fried chicken and vegetables. After the meal, finally, we were able to go snorkelling. We were not disappointed at all. Present in the housereef of Evergreen Diving are many different species of hard and soft corals of different colors. Obviously, this reef is in recovery from the worldwide coral bleaching that happened several years ago because the color is mostly on tips of the hard corals. I also saw lots of fish and starfishes. The Evergreen Diving housereef did not disappoint me at all. I liked very much the native cottage where we slept. It was very basic (I think even the plumbing was constructed by Arno) but somehow in a nice secluded island, that's how it should be. 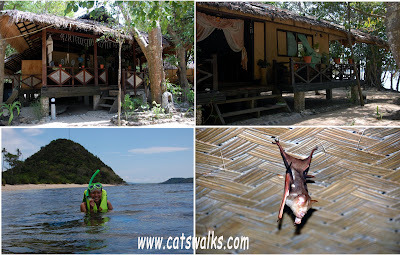 The resort was quite "natural" so we also had a few wild animals in our room like 2 bats and other unidentified creatures. The electricity goes off at about 10 pm so when the animals start making noise at midnight I have no interest to identify them. The only thing I did not like in this resort was the food. Being in an island in the middle of nowhere, I guess one would expect to eat fish and seafood. I was a little disappointed to have always been served chicken. One high point about this place was it made me try to scuba dive. It helped a lot that the dive instructor, Olivier, made us feel very comfortable and safe. I came there without any intention to dive, but after an hour of talking with him, my husband and I committed ourselves on going on a discovery dive with him the next day. Diving was such a big discovery for me. I loved it. I loved to see the corals and fishes so close. I loved the wreck (Lusong Gunboat) where we dived. It was great. I loved it so much that next year I will do a full course. Take note, this is coming from someone who doesn't know how to swim (I took swimming lessons twice but I don't like swimming). Take note that Evergreen is a diving resort, so that's what people from the other side of the world come here to do. Busuanga is famous for wreck diving. I believe there are 10 Japanese wrecks there. The only really negative event about this whole trip was when our boat had an engine problem and stalled halfway between Popototan and Coron. We were probably 100 meters in front of Sangat Resort. Night was falling fast and we were still 1 hour away from Coron. We were drifting. I was a little scared. We tried to signal to Sangat with our flashlights to help us and then we tried to shout for help. They didn't bother to help us at all. So much for helping your fellowmen in need. We used our last bar of battery on the cellphone to SMS Arno that we were in trouble. Imagine our disapointment when he replied that he made a wrong computation on our bill and we needed to pay him a few thousand pesos more but said nothing about helping us and in fact he didn't do anything to help us. I was terribly upset! That was not really a good time to ask us for more money. Another thing that was amazing for me was that the people on the boat (the owners of the boat and some people from Evergreen Resort) were so afraid to call for help. I felt that they were afraid to be charged by Sangat if Sangat sends a motor boat to help us. In the end, the boatman SMSed another boat to fetch us which took a few hours to arrive (of course we were not fully informed if a boat will really come or when it will come). We were stranded for 4 hours! In fairness, Arno did not make us pay the transportation from his island to Coron but of course we had to pay the few thousand pesos he miscalculated. Do you have their contact number so we can book for our accommodation? hey. can you provide me a contact person for our palawan trip -- contact person for accom or boats? It seems that your experience was worst than ours. Aside from the owner's attitude, we didn't have that much of a problem. Thanks for sharing your experience.